Ed Thompson is a joyful third-generation missionary, recording artist, published author and the President of LOGOI Ministries, which for 47 years has worked extensively in the Spanish-speaking world to “equip God’s people to do His work and build up the church, the body of Christ” (Eph. 4:12). Ed has written dozens of articles, three books, and a column for a Miami newspaper. We are thrilled to announce that his latest book, Monkeys in my Coconut Tree has just been named Silver Medal Winner in the Readers' Favorite 2016 International Book Awards! 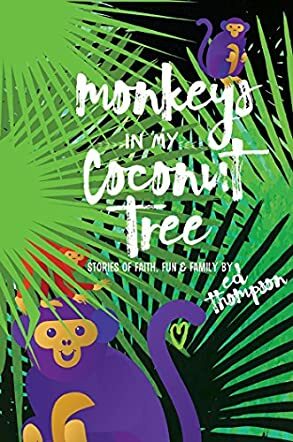 A title like Monkeys in My Coconut Tree: Stories of Faith, Fun & Family by Ed Thompson certainly grabbed my attention and had me hoping for some lighthearted humor, and I found that and so much more! Ed Thompson provides a fantastic compilation of short stories with Monkeys in My Coconut Tree that certainly deserves a second reading. I have to admit that when I first picked up this book I found myself hooked and read it as fast as I could because I wanted to know what humorous story Mr. Thompson might share next. Along with the humor, though, are little gems of inspirational insight that give this book a devotional type quality that allows the reader to understand God's wisdom and love. Each story is told in a very relatable manner that easily draws you in, and the descriptions allowed me to feel like I was in the midst of each story, seeing it unfold through the author's eyes. There was often tongue in cheek humor, but sometimes laugh out loud moments as well. However, each story also shares a "God" moment too, and it's those moments that touch the heart and provide inspiration. From the story of the author getting a pedicure with his daughter to the one about the monkey breaking his arm, each one is unique and often tickles the funny bone. Some stories were a bit poignant, such as the one where he shares about his daughter being married. Mr. Thompson has a knack for pairing the perfect scripture with each story in order to provide a spiritual connection to how God often works in life. The author doesn't just share life lessons; he also shares God lessons. Monkeys in My Coconut Tree is a book that put a smile on my face and provided a spiritually refreshing boost for my heart. Life is a parable, a simple story full of many lessons, if only we are open enough to listen and to learn. We learn from our successes; we learn from our failures, but not a day goes by that we don’t learn from what we do, what we don’t do, and what people all around us do. Jesus taught us valuable lessons and morals through the telling of parables. We can take stories from our own lives and create a parallel to our Christian teachings, our Christian faith. And we can do it seriously or with a dash of humor added in for good measure. Don’t forget that God does have a good sense of humor. Ed Thompson, born into a family of preachers and missionaries (at least two generations worth), came by his faith with fervent passion and was able to overcome the possible interest in becoming a Buddhist monk like his childhood hero in the TV show, “Kung Fu.” David Carradine may have roamed the American west combating evil, but Ed, although he has roamed the American west, never did learn Kung Fu or judo, so his initial dream of becoming a Kung Fu Christian didn’t materialize. In fact, as the author admits in Monkeys in My Coconut Tree, he is anything but a Kung Fu Christian as he is “a deeply flawed, weak and unworthy sinner saved by God’s grace.” But he does have a way with words and he does have a pocket full of stories, or parables if you will, to help all of us work our way through the mire of this difficult, challenging, but also joyful journey called life. “The list of ways to enjoy life is endless,” the author writes. Ed’s stories are simple family stories, like the one about his young son and the tooth fairy who kept forgetting to take away the baby tooth and replace it with a coin, or the passionate father who rescued a heartbroken son who sat by his lemonade stand all day without any sales. Then there are the sad stories, that are also full of joy, as Ed sits with his dying father, knowing full well that in losing his Dad, his Dad will find a peaceful home in Heaven. And Ed’s father’s parting words, “Now, it’s your turn,” become Ed’s parting words to us as we pick up the torch to listen to life’s daily lessons and to enjoy life. This is a book of parables, family stories for young and young at heart. It is full of joy, sorrow, and a little bit of humor and it’s a real pleasure to read and study. A very compassionate collection. And yes, there was a monkey in his childhood tree. There is a story in the monkey as well. Monkeys in My Coconut Tree by Ed Thompson is a witty and humorous collection of stories that will make you laugh and cry, they will inspire you and encourage you through Ed Thompson's ability to use everyday situations to illustrate God's truth and grace. Each chapter tells a specific life incident, related with humor and sometimes in a melodramatic style, that always ends with a golden nugget of truth to help put all things in perspective. The stories range from child rearing to home repair to the death of a loved one, and all are entertaining and inspiring. As you read this book, you cannot help but look at your own life experiences and suddenly see the hand of God in each one of them. Ed Thompson has the unique gift of relating serious information in a humorous and captivating way. It is hard to put this book down; the humor and wit draw you in and hold your attention chapter after chapter. Ed Thompson has a special way of sharing the Gospel of Christ and His hope by using day to day experiences that we can all relate to. Ed's stories are entertaining and every story takes us to the scriptures and a relatable lesson on how God operates in our everyday lives. This book encourages us to keep a sense of humor in the worst of times and each verse cited reminds us that we are not doing this alone. I would love to see this book in print. Monkeys in my Coconut Tree by Ed Thompson is a compilation of twenty short stories based upon his life experiences. Each story has a comedic/satirical bias, but at the end likens the experience to one’s relationship with God. The stories range from ‘forgetting’ about the tooth fairy on two occasions which resulted in a very unhappy child, to setting up a lemonade stand and having no buyers, to being colour blind. Many of the stories feature the writer’s own father and the analogies between his natural and spiritual father are well described and well executed. Whilst there is some sadness as the writer bids his father goodbye, there is also hope and joy with the knowledge of his father’s onward journey to a better and pain-free place with Jesus. The writer, Ed Thompson, has created a lovely series of short stories which relate to everyday life events, but reflect on the lesson learned and how a simple experience can reinforce the relationship with his heavenly father. Each analogy is backed up with verses from the Bible and his words are sound and encouraging. This is an ideal book to pick up each day and read one of the stories, smile at the writer’s clear sense of humour, and then contemplate the more hidden meaning behind the simple tales. The book also gave an insight into Ed Thompson as a person – how he views the world around him. The book cover is eye-catching and a clever addition, given that one of the stories in this book has the same title. Monkeys in My Coconut Tree: Stories of Faith, Fun & Family by Ed Thompson is an entertaining, funny, and inspiring collection of real life events/stories. The author recollects events and situations that occurred and his and his family’s reactions. The result is an entertaining and humorous set of twenty stories, each one leading us to consider a teaching or reminder of a biblical and Christian truth or perspective. The Tooth Fairy is the story of Ed and Jenn’s young son’s hope for a visit from the tooth fairy – the message being that God never forgets us. My Color Blind Life refers to the way we are all made uniquely and perfectly in God’s eyes. Other themes include spending more time with God, our Creator’s compassion, understanding and patience, trust, loving our neighbor, taking advice, and living life to the full. Ed Thompson’s book is well written in an easy to read style and with a joyful and very humorous tone. The events recorded by the author are all very relatable, concerning many everyday occurrences experienced by us all, and some slightly unusual situations too, which are very funny. This book was a joy to read. I loved the humor and the stories had me laughing out loud on many occasions. The tie-ins with life lessons are lovely. Ed Thompson knows just how to make the Christian message relevant, encouraging us to see God’s ways, love, and purposes in the everyday ups and downs of ordinary life. The book offers hopeful and comforting ways of viewing life and dealing with situations. My favorite chapter was A View from the Bleachers with its message about adjustment and the new role for parents when children grow up, leave home, and the task of entrusting our children to God. I also like the way the book ends with the reminder to step up to taking “our turn,” our responsibilities, and living the full lives God has for us. Entertaining, insightful, full of wisdom and encouragement and recommended.